SHOROT KAALER RODER JHILIK CHAAYE SHOBAAR DIKE. MAA AASCHEN BOCHOR GHURE AAR KICHUDIN BAAKI! 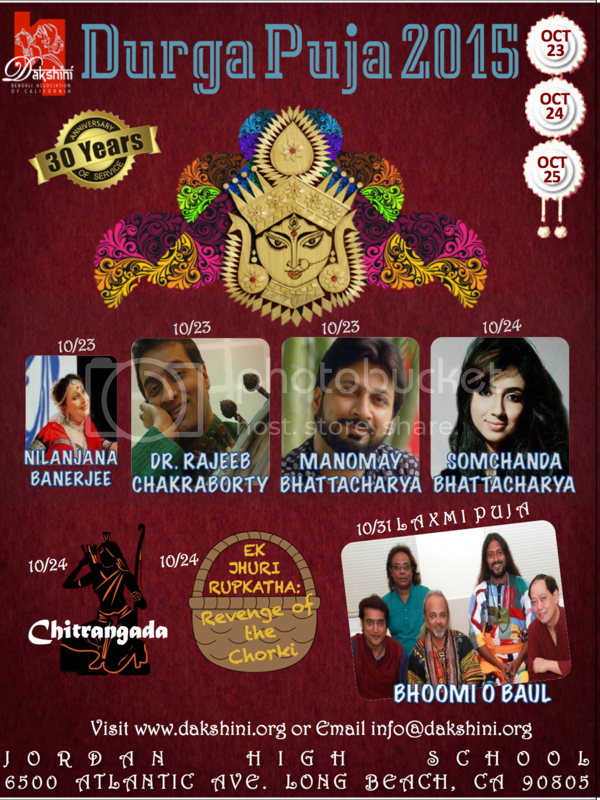 This year marks the 30th year of Dakshini Bengali Association of California! We will be celebrating the auspicious Durga Puja on October 23rd to October 25th. Below is the entertainment lineup. Please contact Bidhan Ray @ bidhanray@yahoo.com or Shubharoop Ghosh @ shubharoop@gmail.com for details of sponsorship. This year's Laxmi Puja food and upcoming Ankur Dube Memorial Talent Show is being sponsored by our platinum member Dr. Kisholoy and Latika Goswami.